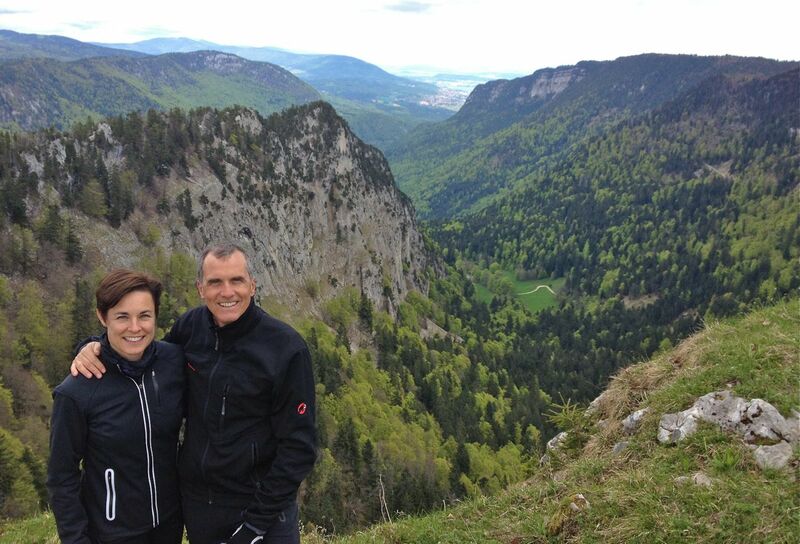 On a holiday Monday last week Kathryn and I drove into the Jura mountains near Neuchatel, about an hour away, to do some hiking. Our plan was to check out a rock feature called the Creux du Van, a giant horseshoe-shaped cliff-face or cirque that the Swiss sometimes compare to the Grand Canyon. The Creux is located at the top of a peak that is about 4500ft high, and is accessible by a number of different hiking trails, all of which involve climbing about 2000ft on foot. We chose the Sentier des Quatorze Contours, a thigh-busting 8km circuit that reaches the top via 14 switchbacks, and runs along the lip of the Creux before returning down the other side. The trailhead is in a small village called Noiraigue, in the Val de Travers, which we learned when we arrived was once an important area for the production of the notorious and very popular 19th century alcoholic beverage absinthe – a strong herbal spirit – which was eventually banned across most of Europe in the early 20th century due to its connection (unfounded) with a number of deaths and general association with bohemian lifestyles. The ban was eventually lifted in the 1990s and the area has seen a revival of the production of wormwood, fennel and other plants that make up its key ingredients, along with the emergence of dozens of cottage absinthe distilleries. I made a mental note to return to the area another day to do some further research! Should make for an interesting future blog post. 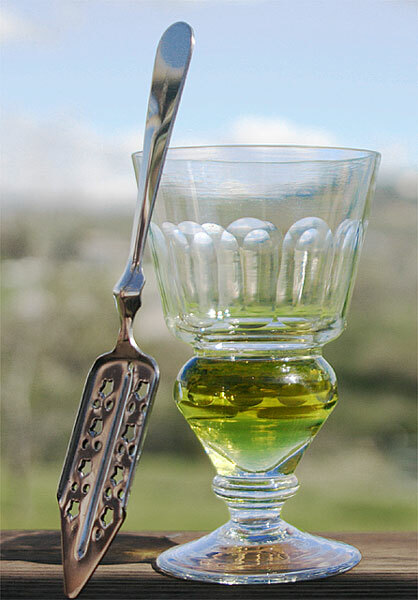 A traditional glass of absinthe verte. The climb to the top of the Creux was a vigorous one and we were rewarded for our efforts by spectacular views of the 150m high cliffs and the bottom of the glacial cirque far below. The horseshoe-shaped feature itself stretched 1.5 kilometres across. Comparisons to the Grand Canyon are a little exaggerated, but it is still a pretty spectacular feature. 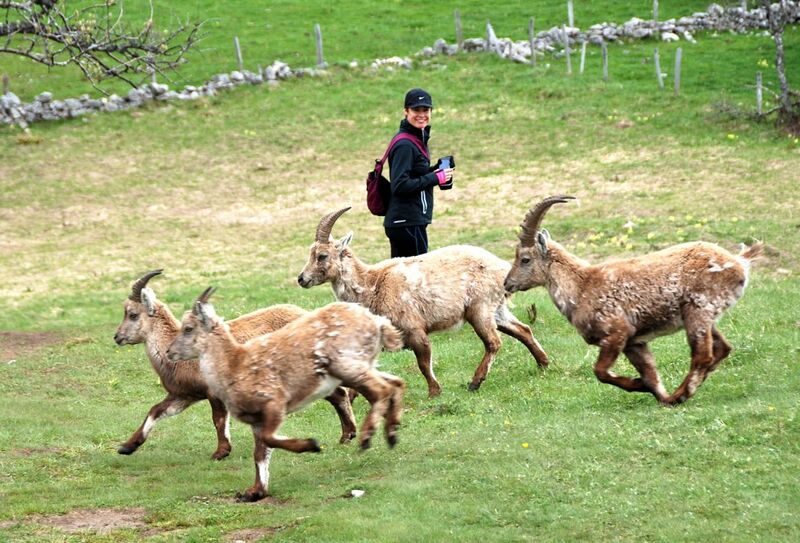 We also enjoyed watching a small herd of wild ibex feeding and frolicking along the cliff edge. Before heading down we dropped into a ramshackle old chalet called the Ferme Soliat that served hot drinks and homemade pies and pastries; a great place to rest the feet and warm up by the open fire. The Swiss countryside is dotted with little chalets like this one and they have become one of my favorite little indulgences when out on hiking and xc ski trips. Kathryn and I on the edge of the Creux du Van. On a final note, this being Europe, one is constantly running into little plaques commemorating the birth, death, or visit of some famous historical figure or another. 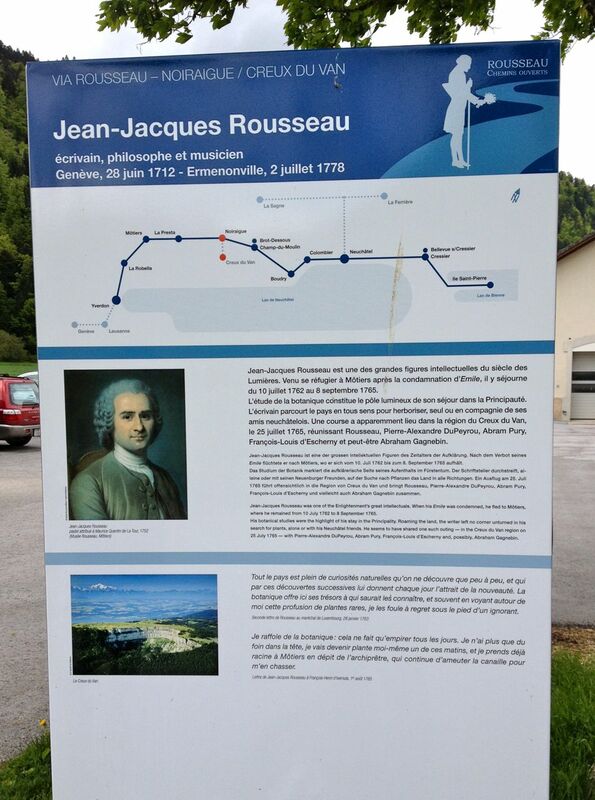 On this day we stumbled upon an interpretive sign near Noiraigue commemorating a visit to the area by the famous Geneva-born philosopher of the 18th century Jean-Jacques Rousseau. Apparently Rousseau hid out in the area between 1762 and 1765 in order to avoid arrest in Geneva after his book, Emile, or On Education, was banned for espousing radical ideas about education and religion that enraged the authorities. Rousseau spent 3 years writing books and collecting wildflowers (and drinking absinthe perhaps?) before being forced to flee once again, this time to England, after his house in Motiers was stoned by angry villagers. Another reason to return to the area again soon and investigate its history. Interpretive plaque for the “Via Rousseau” through the Val de Travers.